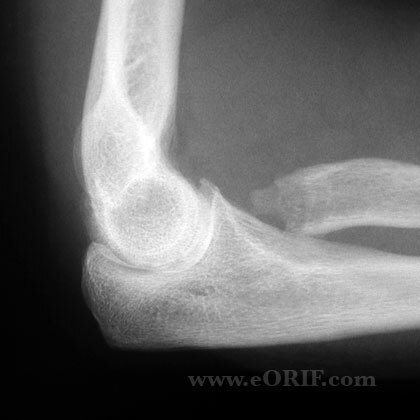 Found in nearly 20% of all elbow trauma, most common fracture of the elbow. 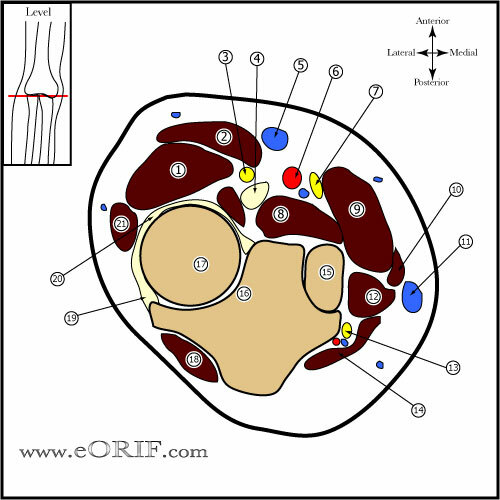 Commonly results from a fall on the outstretched hand with pronated forearm resulting in axial, valgus and external rotation forces. Stabilizing role of the radial head may become predominant if there is concomitant injury to the interosseous membrane or wrist (the Essex-Lopresti lesion). Radial head excision may result in loss of strength, valgus instability, and proximal migration of the radius leading to wrist pain in these situations. Studies of static loading across the elbow have suggested that as much as 60% of force is transmitted across the radiocapitellar articulation. (Morrey BF, JBJS 1988;70A:250). Force transmission across the radial head is greatest between zero and 30 degrees of flexion, decreases with increased flexion. Force transmission is greater when the forearm is pronated than when it is supinated (Morrey BF, JBJS 1988;70A;250). 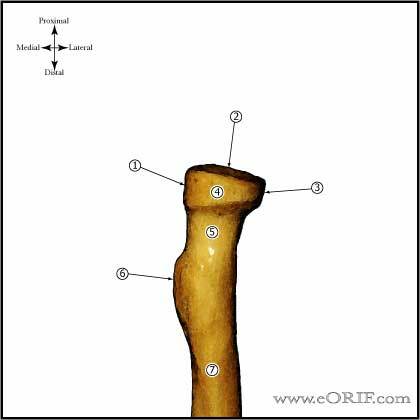 PIN: with pronation the PIN is @3.8mm distal to the articular surface of the radius. (Diliberti T, JBJS 2000;82:809). The PIN wraps around the radial neck and may be directly adjacent to bone. The forearm should be pronated during dissection and retractors should not be placed over the radial neck. Swelling, tenderness, ecchymosis, pain over lateral elbow. 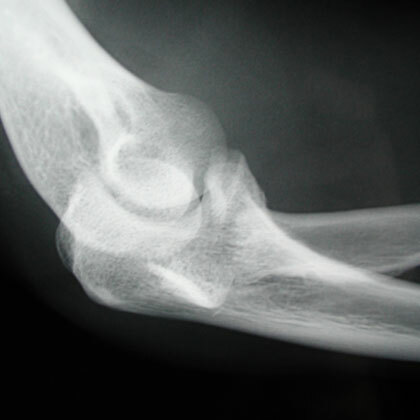 Elbow is often held at 80° of flexion ("resting position") which maximizes capsular volume, decreasing pain from effusion. Limition of elbow motion, especially suppination / pronation. Evaluate for mechanical block to motion. Palpation of the wrist and DRUJ should form a part of the examination of every case of suspected radial head fracture to evaluate for Essex-Lopresti injury. Must document that no bony block to forearm rotation and flexion/extension exists. 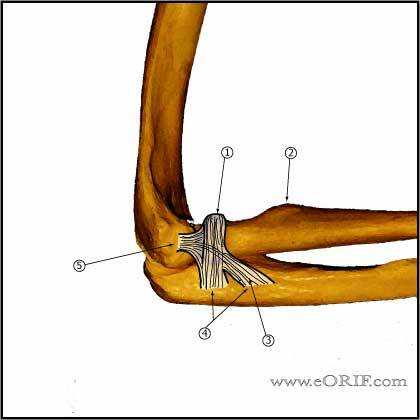 Elbow Aspiration=forearm is pronated to minimize the possibility of trauma to the radial nerve, and the needle is introduced through the center of a triangle formed by the radial head, the tip of the olecranon, and the lateral epicondyle. Aspirate hematoma and then inject 1% lidocaine without cpinephrine. 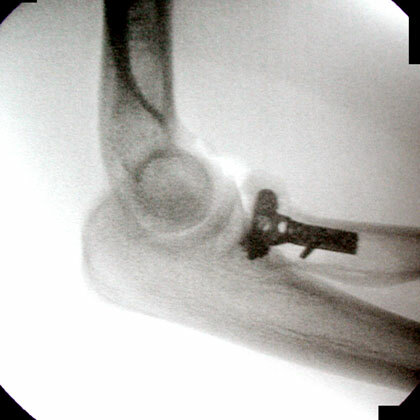 A/P, lateral and oblique elbow films indicated. Elevation of the anterior and postior fat pads(sail sign) indicates intraarticular hemarthrosis and may indicate non-displaced Fracture. Anterior fat pads are commonly seen. Posterior fat pad sign is associated with intraarticular fracture. Bilateral PA views of both wrists in neutral rotation should be obtained to evaluate ulnar variance in patients with wrist pain. 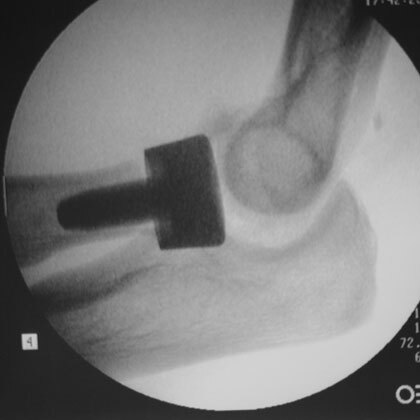 CT can better delineate fracture configuration, but is generally not needed. 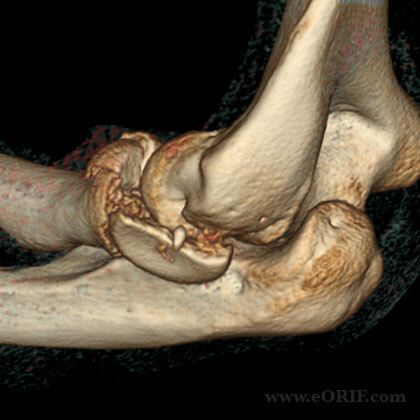 3D reconstructions can greatly enhance the pre-operative plan for complex fractures. Treatment: Posterior splint or sling for 1 week followed by early active range of motion. 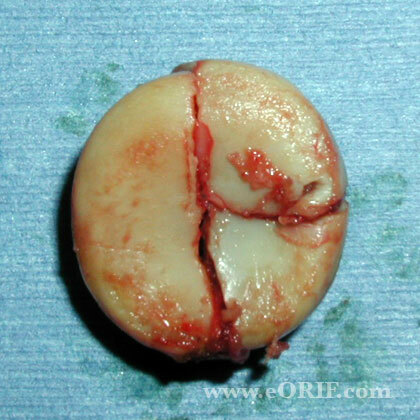 Consider hematoma aspiration and local anesthetic injection to fully assess ROM if evaluation is limited by pain. Consider static progressive nightime extension splinting if a flexion contracture is present 6 weeks after injury. Treatment: examination under anesthesia. IF mechanical block to motion, or joint instability or displacement >3mm=ORIF; if stable, <3mm displaced with full ROM nonop treatment indicated. 82% of patients are asymptomatic at 19yrs with non-op treatment (Akesson T, JBJS 2006;88A:1909). 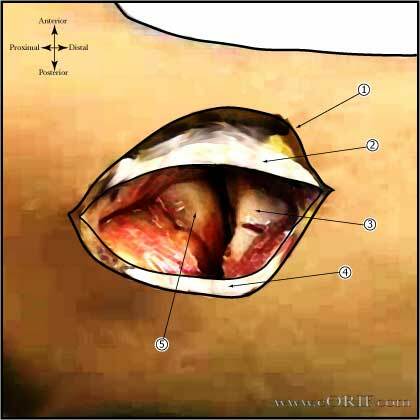 Determination of Type II or Type III fracture type can often only be made intraoperatively. Have radial head replacement available. Treatment: excision (Herbertsson P, JBJS 2004;86A:1925) vs Radial Head Replacement (Moro JK, JBJS 2001;83A:1201). Excision alone is contraindicated when either medial collateral ligament or interosseous membrane disruption is present. Either replacement or reconstruction is indicated in these cases. 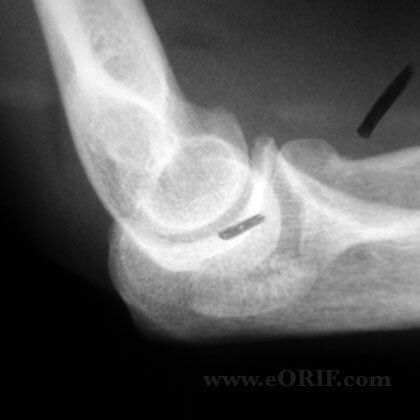 Type IV: radial head fracture with ulnohumeral dislocation. Treatment same as Type III. Wrist pain (interossious ligament / DRUJ injury / TFCC injury). 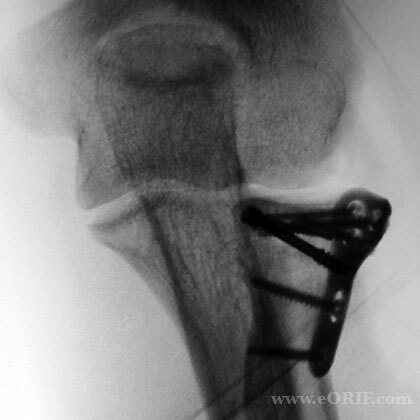 Reported complications with radial head excision include loss of grip strength, pain at the wrist, valgus instability and posttraumatic arthritis of the trochlear-olecranon articulation. 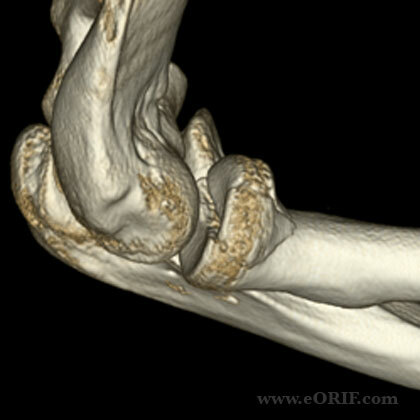 Nonunion: (Ring D, CORR 2002;398:235). 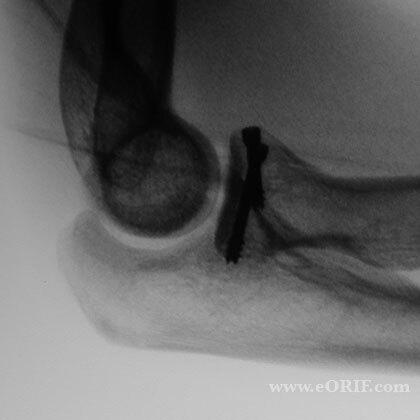 Post-op: Splint with forearm in supination or neutral. Start early active range of motion as soon as possible. Consider Indomethacin 75mg QD/NSAIDs for patients with complex dislocations or Radial head replacement HO reduction. 7-10 Days: Evaluate incision, remove stitches, Begin early active range of motion as soon as possible. Consider hinged elbow brace for high energy injuries/instability. Start physical therapy. Avoid flexion in pronation. Patients with Essex-Loprestic injuries are held in full supination for 3-4 weeks. 6 Weeks: Consider static progressive nightime extension splinting if a flexion contracture is present 6 weeks after injury. 10° to 15° flexion contractures are not uncommon. If DRUJ treated by pinning remove pins at 6wks. 3 Months: Progress with ROM. May take 6-12 months to regain ROM. Begin sport specific therapy. 1Yr: Assess outcomes, repeat xrays.